Madhuri Dixit is one of the most beautiful and talented actresses to have worked in the Hindi film industry till now. She was considered the top actress and the reigning queen of the industry in the eighties and the nineties and continues to rule the hearts of millions of fans even now, after she has got married and settled into her family life. Till date, fans eagerly await her films, in which she appears on a periodic basis. Income Sources: Madhuri Dixit Nene has ruled Bollywood for more than a decade, which is the reason why she still makes a whopping Rs 4 crore from each of her movies. She also appears in several television shows like “Jhalak Dikhhla Jaa” and makes a huge annual income of Rs 25 crore. She has also been roped in to endorse a number of leading brands, such as Olay, Maggi and Chawanprash, which fetch her millions of rupees. Marital Status: Married to a US based doctor, Dr Sriram Madhav Nene since 1999 and has two sons, Arin and Rayaan. 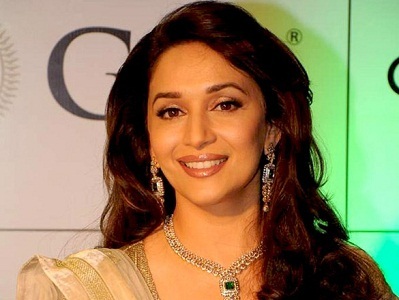 Madhuri Dixit Nene was born in Mumbai and hails from a Marathi Chitpavan family. She received her school education from Divine Child High School and studied microbiology from the Mumbai University. But fate had something else in store for her, as she was destined to become one of the most famous actresses of the country. She loved dancing since her childhood days and took formal training in kathak. She was involved with actor Sanjay Dutt during the making of film “Saajan”, but the actor’s involvement in the TADA case was the reason of her severing ties with him. Besides her impressive film and television career, Madhuri is also known for her humanitarian works. She has recently become the brand ambassador of a campaign “Emeralds for Elephants”, which is endeavored to save elephants and prevent massive deforestation being carried out in the world. She has also worked for the welfare of orphaned and cancer affected children, besides raing a voice in favor of women’s rights. The world famous painter M F Hussain was a big fan of this gorgeous actress and had watched her movie “Hum Aapke Hai Koun…. !” 67 times. Madhuri made her career debut in 1984 in a Rajshri movie called “Abodh”, which fetched her rave reviews for a brilliant performance. “Tezaab” opposite Anil kapoor was her first big hit and it fetched her the Filmfare Award for Best Actress. It was followed by a string of hits, including “Ram Lakhan”, “Saajan”, “Tridev”, “Parinda”, “Dil”, “Beta” and “Khalnayak”. But the best was to come yet, and it came in the form of the rajshri film called “Hum Aapke Hai Koun…. !”, which is one of the biggest hits of the industry till date. Madhuri continued to churn out hits after her marriage, with big names like “Devdas”, “Gaj Gamini”, “Pukar” and “Gulaab Gang”. Despite coming of age, she continues to rule the hearts with her grace, poise, dancing talent and charming smile. Madhuri Dixit Nene settled in the US after marriage, but moved to Mumbai a few years ago. She owns a number of luxurious apartments and commercial properties in Mumbai as well as the US. She has a luxurious fleet of cars, which comprises of Audi, Rolls Royce and Skoda Rapid.